Draw the attention your company deserves and more with the unique circle-style of an A-Frame pop up banner stand. The circle A-Frame attracts attendees and new customers with its beautiful fabric dye-sub print and are printed double-sided for maximum exposure from every direction! These stunning, yet simple banner stands are ideal for sporting and golf events, promotional signage for storefronts, and trade shows! 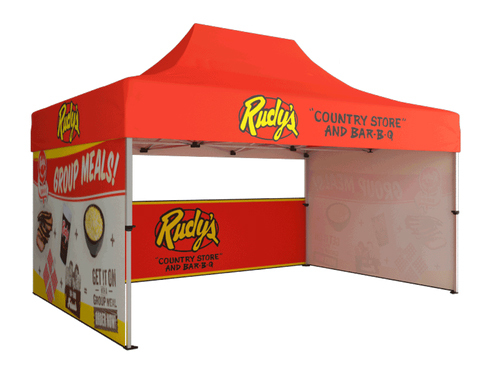 The A-Frame banner stand has a metal folding frame allowing for setup and breakdown in just seconds. A-Frames also include stakes to hold the banner stand in place during outside promotional events.